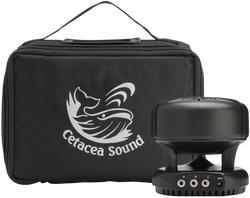 The Ensémble portable classroom speaker system is for teachers, trainers, and professional presenters who value a lightweight audio solution for on-the-go teaching. Its unique, patented design delivers clear, evenly distributed sound to everyone in the room regardless of seating arrangement. Connect up to 3 simultaneous sources like a computer, iPod®, DVD player, projector, or microphone. Weighing less than 1 pound, the Ensémble speaker travels conveniently and is loud enough for presentations to 90 people. The Ensémble’s 3-input mixer makes it easy to run a variety of multimedia and voice presentations. Connect up to 3 stereo or mono devices, including: microphones, projectors, DVD and CD players, computers or an iPod®. The included carrying case is a wonderful convenience for staying organized while traveling. Made of tough, lightweight polyurethane foam, it secures the Ensémble from unexpected bumps on the road. No other portable desktop speaker can deliver the voice clarity needed for high-impact presentations.